"Having lived by the Chesapeake Bay on Kent Island, MD nearly my whole life, I was challenged to develop this authentic Maryland style crab cake about a year ago. Many people claim to have the true Maryland crab cake, but this one uses all lump meat with almost no filler added and tastes incredible! Let me know what you think!" Combine bread crumbs, baking powder, parsley, mustard powder, pepper, and seafood seasoning; set aside. Stir together mayonnaise, butter, Worcestershire, and egg product until smooth. Fold in crab meat, then fold in bread crumb mixture until well blended. Shape mixture into 12 crab cakes, about 3/4 inch thick, and place onto prepared baking sheet. 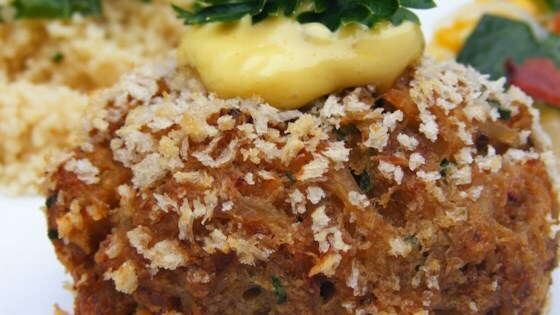 These crabmeat loaded cakes are perfect for a light lunch or as appetizers. To make a lighter version, omit butter, use fat free mayonnaise, increase the bread crumbs to 5 tablespoons, and use egg whites instead of regular egg product. replaced mayo with ranch, used cajun seasoning instead of seafood, and added some chopped celery. My husband always rave about Maryland crab cakes and he said that these were pretty good! I baked them in a muffin pan, so they were all even and brown on all sides.